My four, yes four May Glossyboxes finally arrived which were collaboration boxes with Bergdorf Goodman! I felt like a dope because I had never heard of Bergdorf Goodman before this, maybe it was mentioned in Gossip Girl and I just don't remember, but oh man did I go a little crazy on the boxes! When I found out that once you're subscribed you can gift boxes to yourself for only $15 each, and the $25 Bergdorf Goodman gift card that's in each of these could stack! 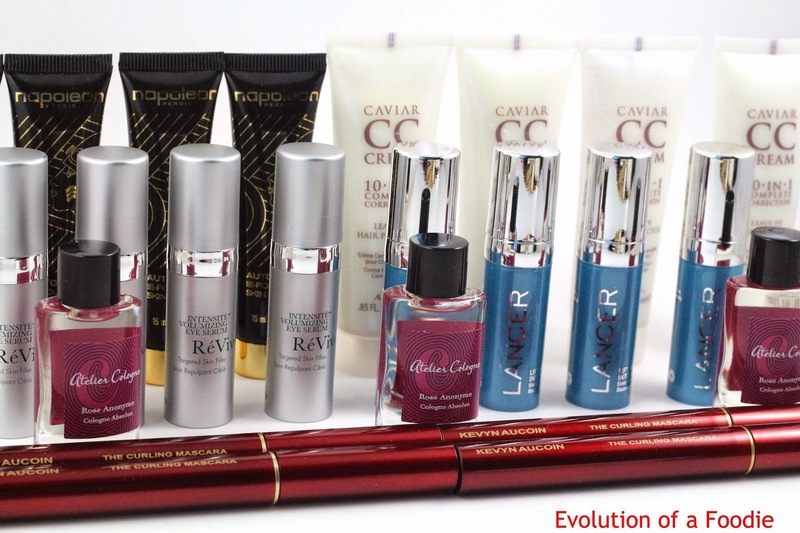 Plus each box had a crazy retail value, and it was a chance for me to try some high end brands and products that I probably never would have purchased on my own. It's safe to say I had some issues with Glossybox shipping this month. I originally ordered five boxes, my actual subscription that I paid for a month ago couldn't be shipped because they sold out. How that happens when I ordered it on May 15th is beyond me, and why it wasn't shipped earlier is also beyond me, so I was pretty ticked about that. They did refund me for it and send me the gift card code. Then these took forever to arrive, and when they did I was missing a sample from one. It wasn't a good logistics month for Glossybox and I think the problems outweighed the awesome value of this box. 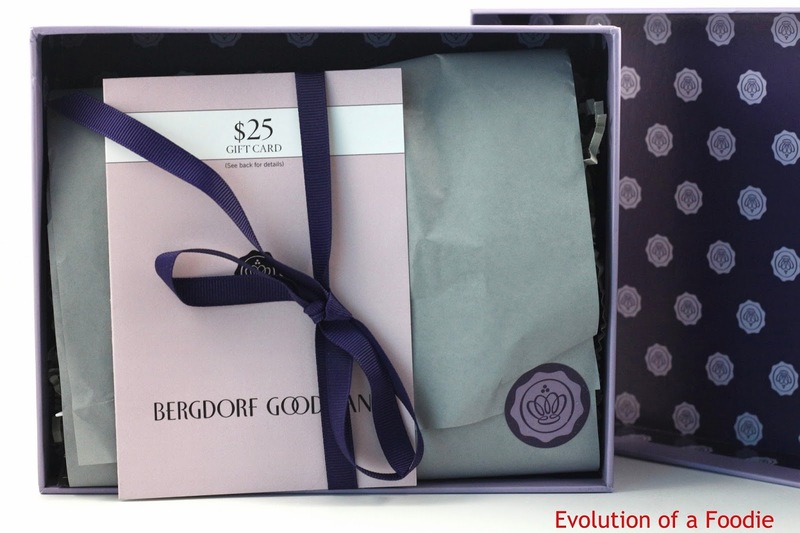 The purple Bergdorf Goodman packaging was quite nice this month, and I love the purple boxes they were in! Here's the info card for all four of my boxes, as they were all the same. You can see it seems my card has a different mascara than I received though. 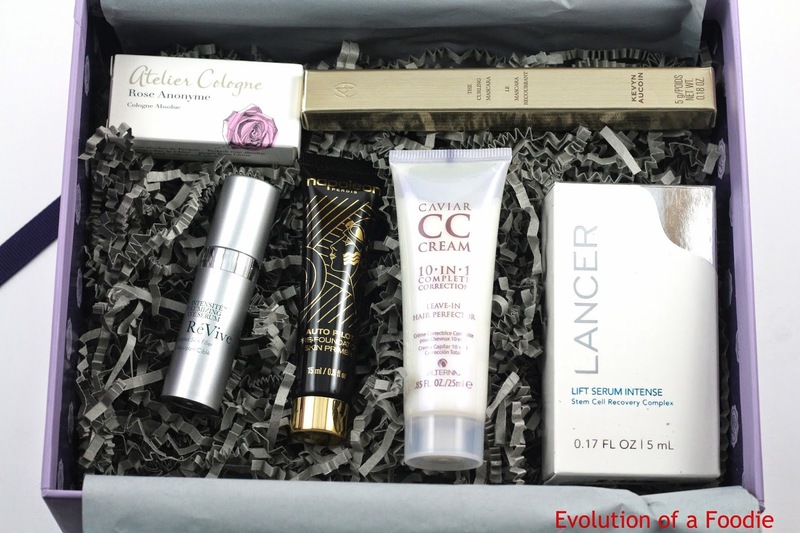 The first look at everything in my box, I had filled out my Glossybox surveys on my profile for these, but sort of forgot what was going to be in them by the time they arrived. So it was a little bit of a surprise. There were a lot of creams though, as much as I loved the value of them, I wished there were a few more makeup items. I don't know if everyone needed two skin serums. 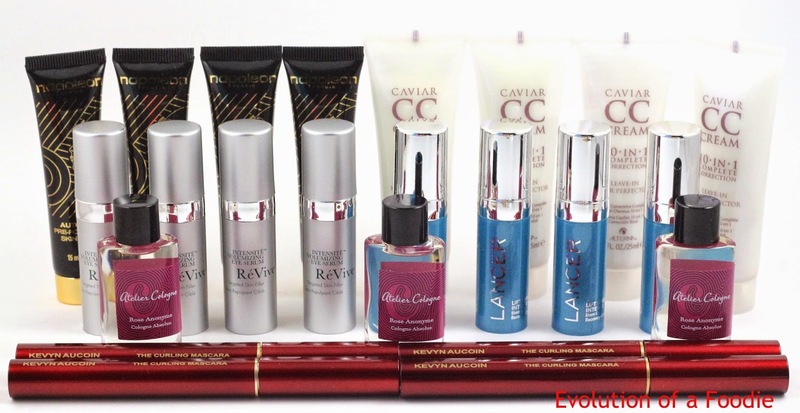 Revive Intensite Volumizing Eye Serum - ($70 each/$280 for 4) This is a really expensive eye cream, so basically I expect to use it and never get wrinkles lol! Getting 4 of these is nice because it's almost the full size and it will take a little while to see results. Napoleon Perdis Auto Pilot Pre-Foundation Skin Primer - ($13 each/$52 for 4) I don't use a primer so I'll have to experiment with it to see how I like primers. Alterna Caviar CC Cream - ($8 each/$25 for 4) This is a leave-in hair "perfecter" which I am interested to see if it can do anything for my split ends I refuse to cut off! Kevyn Aucoin The Curling Mascara - ($28 full size!/$112 for 4) I was really surprised to see this is a full size, as my info card has a different mascara and shows it as a sample size. I love the red tubes these have, and I'll definitely be stashing these for when I run out of some of my other mascara or I toss some of my older ones. Atelier Cologne Rose Anonyme Cologne Absolue - ($10 each/$40 for all 4 if I had 4) This smells really strong in the bottle, but just put a teeny bit on, and it smells quite nice. It's supposed to have rose and ginger notes, which I could detect a hint of, and it's a very grown up fragrance. I'll feel like such an adult woman wearing it! I don't love it enough to keep all 3 received, so I'll be trading some, but I will still contact Glossybox about my missing one. My beauty sample army! You can see that I'm missing an Atelier Cologne so I'll be contacting Glossybox about that. A close up of my army of samples! Overall this box had a total value of $184 and with 4 boxes (if I had my other perfume) they would have a value of $736! And then once you add in the gift cards it was a value of $836. Considering I only spent $60 on these 4 boxes, it was a pretty generous value. Just an amazing collaboration this month, but it may have been too many problems overshadowing how great this box was. I know by the time I finally got these, I was kind of over the box and just ready to use my gift cards, to get products I actually wanted. 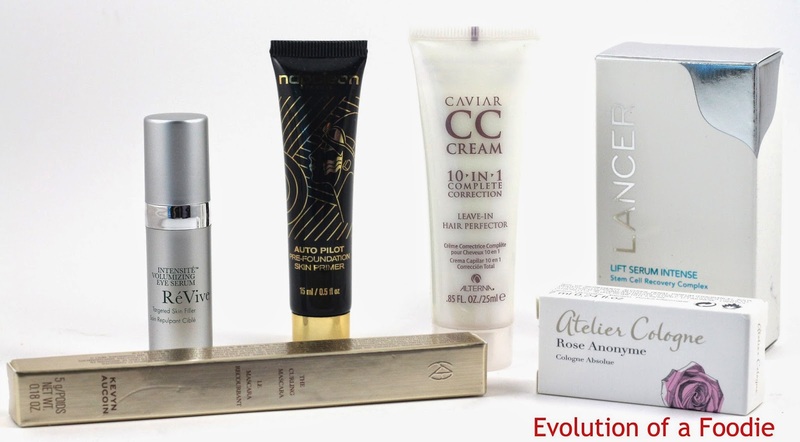 What do you think of this month's Glossybox? Let me know in the comments!